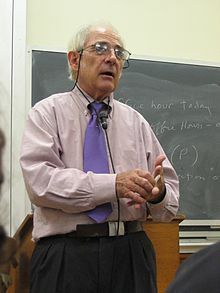 John Rogers Searle (born July 31, 1932) is the Slusser Professor of Philosophy at the University of California, and is noted for contributions to the philosophy of language, philosophy of mind and consciousness, on the characteristics of socially constructed versus physical realities, and on practical reason. He was awarded the Jean Nicod Prize in 2000. The problem posed by indirect speech acts is the problem of how it is possible for the speaker to say one thing and mean that but also to mean something else. It is apparently very congenial for some people who are professionally concerned with fictional texts to be told that all texts are really fictional anyway, and that claims that fiction differs significantly from science and philosophy can be deconstructed as a logocentric prejudice, and it seems positively exhilarating to be told that what we call "reality" is just more textuality. Furthermore, the lives of such people are made much easier than they had previously supposed, because now they don't have to worry about an author's intentions, about precisely what a text means, or about distinctions within a text between the metaphorical and the literal, or about the distinction between texts and the world because everything is just a free play of signifiers. The upper limit, and I believe the reductio ad absurdum, of this "sense of mastery" conveyed by deconstruction, is in Geoffrey Hartman's claim that the prime creative task has now passed from the literary artist to the critic. "The Word Turned Upside Down", The New York Review of Books, Volume 30, Number 16, October 27, 1983. One can imagine a computer simulation of the action of peptides in the hypothalamus that is accurate down to the last synapse. But equally one can imagine a computer simulation of the oxidation of hydrocarbons in a car engine or the action of digestive processes in a stomach when it is digesting pizza. And the simulation is no more the real thing in the case of the brain than it is in the case of the car or the stomach. Barring miracles, you could not run your car by doing a computer simulation of the oxidation of gasoline, and you could not digest pizza by running the program that simulates such digestion. It seems obvious that a simulation of cognition will similarly not produce the effects of the neurobiology of cognition. "Is the Brain’s Mind a Computer Program? ", Scientific American (January 1990). The Rediscovery of the Mind, p. 97, MIT Press (1992) ISBN 0-262-69154-X. Precisely by inculcating a critical attitude, the "canon" served to demythologize the conventional pieties of the American bourgeoisie and provided the student with a perspective from which to critically analyze American culture and institutions. Ironically, the same tradition is now regarded as oppressive. The texts once served an unmasking function; now we are told that it is the texts which must be unmasked. In the performance of an illocutionary act in the literal utterance of a sentence, the speaker intends to produce a certain effect by means of getting the hearer to recognize his intention to produce that effect; and furthermore, if he is using the words literally, he intends this recognition to be achieved in virtue of the fact that the rules for using the expressions he utters associate the expression with the production of that effect. The assertion fallacy ... is the fallacy of confusing the conditions for the performance of the speech act of assertion with the analysis of the meaning of particular words occurring in certain assertions. It seems to me obvious that infants and many animals that do not in any ordinary sense have a language or perform speech acts nonetheless have Intentional states. Only someone in the grip of a philosophical theory would deny that small babies can literally be said to want milk and that dogs want to be let out or believe that their master is at the door. There is probably no more abused a term in the history of philosophy than “representation,” and my use of this term differs both from its use in traditional philosophy and from its use in contemporary cognitive psychology and artificial intelligence.... The sense of “representation” in question is meant to be entirely exhausted by the analogy with speech acts: the sense of “represent” in which a belief represents its conditions of satisfaction is the same sense in which a statement represents its conditions of satisfaction. To say that a belief is a representation is simply to say that it has a propositional content and a psychological mode. The Intentionality of the mind not only creates the possibility of meaning, but limits its forms. The student should have enough knowledge of his or her cultural tradition to know how it got to be the way it is. This involves both political and social history, on the one hand, as well as the mastery of some of the great philosophical and literary texts of the culture on the other. It involves reading not only texts that are of great value, like those of Plato, but many less valuable that have been influential, such as the works of Marx. For the United States, the dominant tradition is, and for the foreseeable future, will remain the European tradition. The United States is, after all, a product of the European Enlightenment. However, you do not understand your own tradition if you do not see it in relation to others. Works from other cultural traditions need to be studied as well. You need to know enough of the natural sciences so that you are not a stranger in the world. You need to know at least one foreign language well enough so that you can read the best literature that that language has produced in the original, and so you carry on a reasonable conversation and have dreams in that language. There are several reasons why this is crucial, but the most important is perhaps this: you can never understand one language until you understand at least two. You need to know enough philosophy so that the methods of logical analysis are available to you to be used as a tool. One of the most depressing things about educated people today is that so few of them, even among professional intellectuals, are able to follow the steps of a simple logical argument. Just acquiring this amount of "education" will not, by itself, make you an educated person, even less will it give you what Oakeshott calls "judgment." But if the manner of instruction is adequate, the student should be able to acquire this much knowledge in a way that combines intellectual openness, critical scrutiny, and logical clarity. If so, learning will not stop when the student leaves the university. The sense in which an automatic door "understands instructions" from its photoelectric cell is not at all the sense in which I understand English. I have only one real message in this lecture, and that is: consciousness is a biological phenomenon, like photosynthesis, digestion, mitosis—you know all the biological phenomena—and once you accept that, most, if not all about the hard problems of consciousness simply evaporate. All of our conscious states, without exception, are caused by lower level neurobiological processes in the brain, and they are realized in the brain as higher level, or system features. It's about as mysterious as the liquidity of water, right? The liquidity is not an extra juice squirted out by the H2O molecules, it's a condition that the system is in; and just as the jar full of water can go from a liquid to solid, depending on the behavior of the molecules, so your brain can go from a state of being conscious to a state of being unconscious, depending on the behavior of the molecules. The famous mind body problem is that simple. The philosopher John Searle once told me that reading Nietzsche was like drinking cognac -- a sip was good, but you didn't want to drink the whole bottle. [John Searle is] right in saying that a lot of Derrida's arguments … are just awful. Richard Rorty, "Essays on Heidegger and Others", (Philosophical Papers II, Cambridge : Cambridge, University Press, 1991), pp. 94-95. According to Searle then, there is no more a mind–body problem than there is a macro–micro economics problem. They are different levels of description of the same set of phenomena. ...But Searle is careful to maintain that the mental – the domain of qualitative experience and understanding – is autonomous and has no counterpart on the microlevel; any redescription of these macroscopic features amounts to a kind of evisceration. Joshua Rust, John Searle (2009).